REO was one of two US companies to attend growing trade show W3+ Fair in Wetzlar, GermanyREO Inc. The W3+ FAIR (www.w3-messe.de) networking trade fair for optics, electronics and mechanics took place in Wetzlar for the third time on 2 and 3 March. Attended by more than 155 companies and partners, 2,737 visitors, more than 30 expert speakers as well as about 20 competence partners, the event once again demonstrated its growth credentials. The number of exhibitors grew by 20% compared to the previous year, and trade visitors increased by 12%. Both sides were highly satisfied. More than almost any other trade fair in Germany, the W3+ FAIR now stands for knowledge transfer and interdisciplinary networking relating to precision technologies, in an increasingly international environment. One can therefore say that it has become one of the key solution-oriented technology platforms for these three high-tech sectors in Germany. The event's cross-sector concept, which appeals to companies throughout the entire value creation chain, was judged to have been particularly successful. The high level of quality of the trade fair itself and of the trade visitors were likewise often commended. The W3+ FAIR 2016 once again provided a platform for an ambitious programme of presentations on the subject areas of "optical metrology, and manufacturing techniques in optics and optoelectronics". Minister Al-Wazir took the opportunity to emphasise the advantage of energy-efficiency networks: "The W3+ FAIR shows that networks can achieve great things. I am impressed by what has developed here over the last three years – the region can rightly take pride in it. Please keep up the good work! We would like to see the same for energy efficiency. I therefore appeal to you to establish energy-efficiency networks. We need your help in achieving our goals of massively reducing energy consumption and ensuring a sustainable and affordable supply of energy." This year also saw the attendance of international delegations for the first time, with these coming from the medical technology sector in the Netherlands, from the high-tech research region of Flanders, and also from the Czech Republic, Slovakia and Asia. The new 'Meet & Greet' event for network and delegation members, which was held for the first time, also proved to be very popular. The Student Day, which was also held for the very first time this year, was received very positively as well. More than 140 students from universities and technical colleges used this day to find out more about career options – thereby providing a perfect pool of applicants for companies at the trade fair that were recruiting. The exhibition organiser FLEET-Events is more then satisfied. Chief executive Christoph Rénevier: "In a very short space of time, the W3+ FAIR has become an important forum for the three sectors. This is the meeting place for executives, decision makers, engineers and technology experts, all of whom are looking for new solutions together. We want to build on this success in 2017." Next year, the W3+ FAIR will take place on 21 and 22 February. The event goes back to an industry initiative in Wetzlar intended to promote networking between the three sectors: optics, electronics and mechanics. New interfaces are to pave the way for future-oriented technologies. 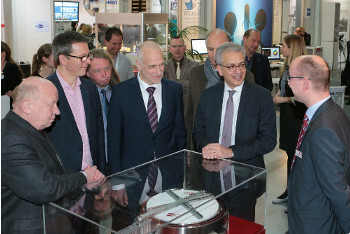 The trade fair took place for the first time in February 2014 in the Rittal Arena in Wetzlar. A highlight of the trade fair is the high-quality and largely free supporting programme intended to promote communication between experts. The W3+ FAIR is being hosted by the Hamburg trade fair organiser FLEET Events.